Hotdog Waffle is a popular snack kids can't get enough of ... though nowadays, fillings range from savory meats to sweet desserts. It used to be just for hotdogs only (and at times with cheese) considering its length and elongated shape but a lot of filling varieties has since sprung out, from bacon and ham to Belgian chocolate, and even native sweets like Halayang Ube and Yema. These Pinoy waffles are familiar offering from kiosks or stands almost every place with large crowd gathering -- mainly because they are handy that you can walk around enjoying it, tasty with different kinds of fillings and more importantly, fills you up without breaking the bank. Made from ingredients like that in a hotcake or pancake (flour, eggs, sugar, etc. ), it is cooked in a hotdog waffle maker which can easily be bought from kitchen appliance centers at the mall. 1 Turn the waffle maker on to preheat. 2 Mix together the flour, baking powder and salt. 3 In a separate bowl, mix all the liquid ingredients together with the sugar until dissolved. 4 Mix the dry and liquid ingredients together. 5 Brush some oil in the waffle maker for easy release. 6 Transfer the waffle mix in a plastic ketchup squeeze bottle for easy dispensing(optional). 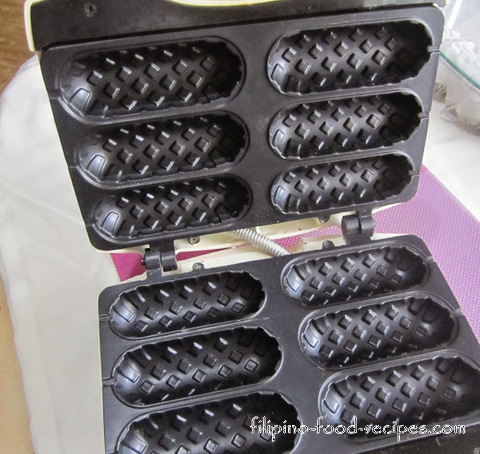 7 Fill the slots halfway through, add your favorite filling in the center and cover with more waffle mix. 8 Let it cook until golden brown, or for 3-5 minutes. 9 Release from the waffle maker and serve hot. 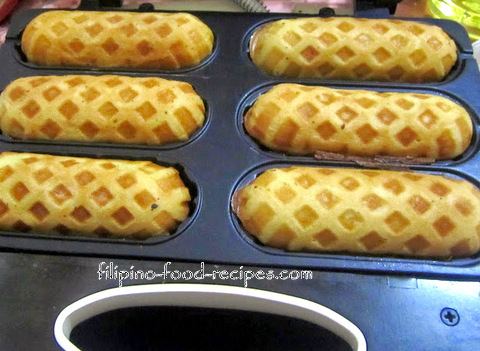 Note : If using halayang ube filling, it should not be thicker (in texture) than the waffle mix, otherwise it will sink in the bottom and be visible on the other end. If it is quite thick, try to dilute in little water before spreading so it will stay in the center.